Fig. 7. Observational studies result in ever higher minimum adequate dosage recommendation due to the powerful effect of dose targeting error as illustrated by the HEMO data. It is a self-fulfilling prophecy inherent in the design of observational studies. 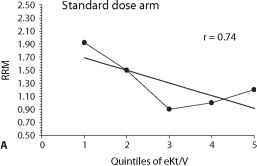 proximate values of spKt/V in the two arms. 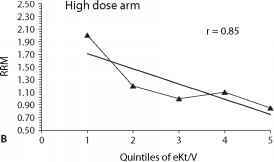 The two arms had equal outcomes, but using OS techniques it would have been spuriously concluded that there was a continuous decrease in mortality over the whole range of dosage despite that fact that very little more solute is being removed as spKt/V increases from 1.0 to 2.0 with thrice weekly dialysis.